I was trying to think of the last time I bought a record on Barsuk. I think it may have been the Dismemberment Plan Emergency and I vinyl reissue. But if we're talking about a Barsuk original, it may go all the way back to the first Death Cab For Cutie record. I don't know if there's a specific reason, but I never seemed to get as moved by their releases as a lot of other folks do. That changes with Charly Bliss. Flat out, this is my absolute favorite record of the year so far. Nothing else has grabbed me with the sort of immediacy that Guppy has. It's essentially a perfect album. That Dog crossed up with Weezer? Kind of. The Rentlas meets Cub? Closer. Ultimately, Charly Bliss have crafted a picture perfect pop album. Peppy vocal melodies mixed with crunchy guitars producing the sort of choruses most bands would die for. On "Glitter," when Eva Hendricks belts out "Am I the best/or just the first person to say yes" it's just the best hook of the year. Some lyrics can stray to the goofy side of the spectrum (wait until you hit the trampoline song), but in general they come across as sly and playful with a knowing, self deprecating wink. 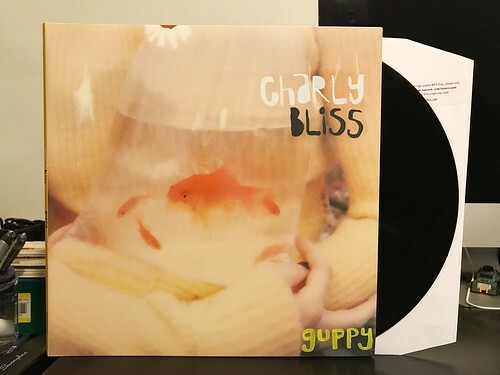 Every song on Guppy is steeped in the sort of dynamic 1990's guitar pop that I've always loved. You can hear bits of Fig Dish, maybe a dash of Treble Charger mixed in with a little Superdrag for good measure. All of the best parts of all of the best bands stirred together into one perfect album. It's been a while since a new band knocked my socks off the way Charly Bliss has. I've been listening to this album nonstop since I got it and with summer coming up, I expect it to keep dominating my turntable. It's just that kind of record.